With the new Media Office, the FUNKE MEDIEN GROUP is moving its headquarters into the center of Essen. The "Media House of the Future" is intended to be a place of creativity, allowing for easy communication between the 1,300 employees and simplifying the work flow. In addition to the offices, the 285-meter complex has its own day-care center, a public media café, a kiosk, service points and event rooms. 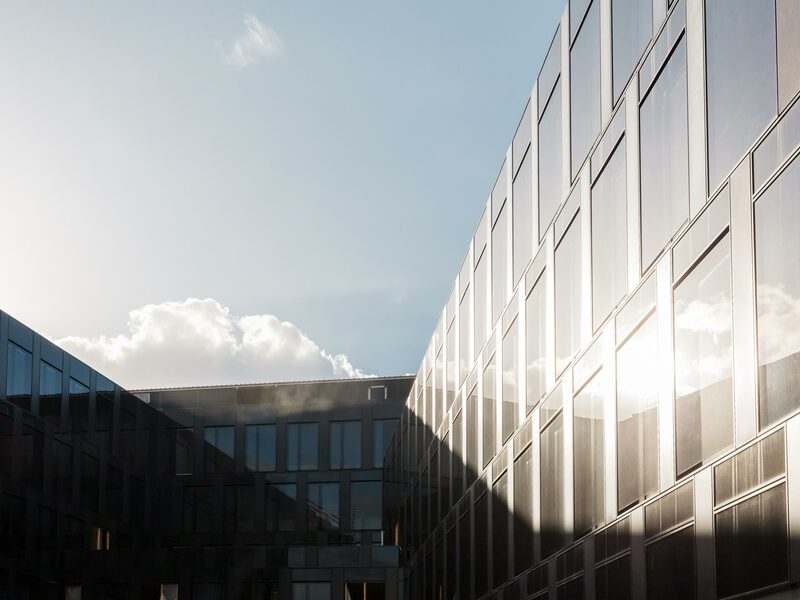 The client wanted a future-oriented building with very low energy requirements: the goal was to fall short of the EnEV by 30% with the lowest possible CO₂ emissions. Nevertheless, there were no compromises in the quality of the climate: in summer and in winter, pleasant room temperatures and good air quality were a must; the rooms must be able to use daylight glare-free and sufficiently and to provide good acoustics. Transsolar developed the energy and climate concept and tested its performance for thermal comfort and energy efficiency. For the areas of the offices, the editorial office and in the Medienhaus2, the concept is based on concrete core activation as energy-efficient surface cooling in summer. Chillers provide active peek cooling. Furthermore a free cooling mode in the shoulder season operates via re-cooling units. The dark facade symbolizes printing ink and thus the newspaper. The idea makes sense from an energy standpoint, because with the "sunglasses" the sun protection closes late and daylight is allowed into the rooms longer. The employees have the advantage of a clear view for a longer period of time. The slats in the space between the panes provide daylight control and are controlled by radiation and temperature. A mechanical displacement ventilation supplies the offices with fresh air. It also cools peak loads in the summer. The users have individual influence on the climate; window elements can be opened for ventilation. Radiators allow for individual heating during the winter months; they are supplied by district heating. 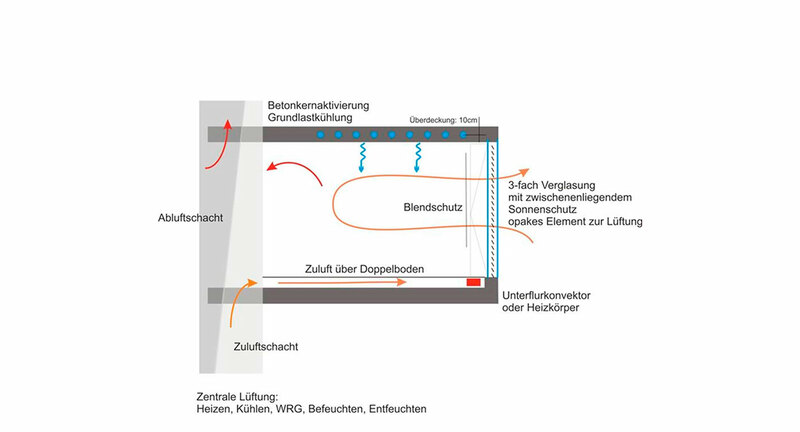 Highly efficient heat recovery in the ventilation system makes waste heat usable again in the heating season and saves energy. Lighting is provided by LEDs in a timely and effective manner. The primary energy consumption is significantly lower than with all other systems for artificial light.